This traditional Levantine salad is made with sweet tomatoes, crunchy cucumbers, salty kalamata olives, fresh parsley, green onions and topped with toasted pita bread. The dressing is made with lime juice, olive oil and crushed garlic. Simple and delicious! 1 c. Pita bread, broken into little pieces, lightly covered in olive oil and baked until crunchy. Cut vegetables and herbs and place in salad bowl (except lettuce). Combine dressing and pour over vegetables. When ready to serve, place lettuce in plate, top with remaining vegetables marinating in the dressing, and finish off with crispy toasted pita bread. 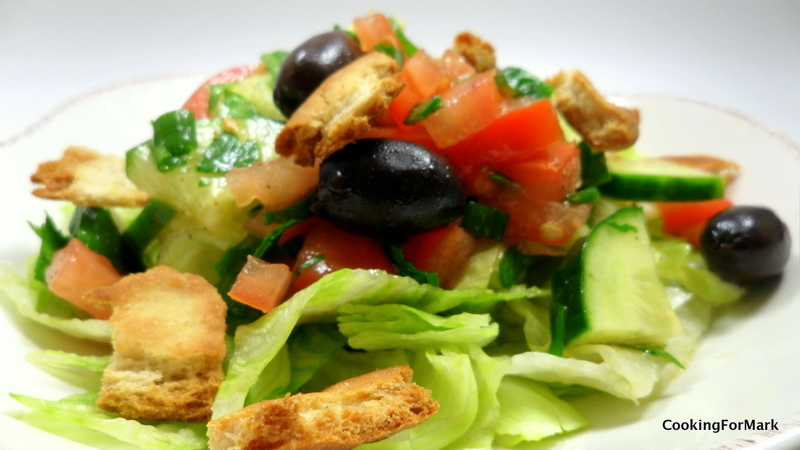 This entry was posted on October 3, 2010 at 7:42 pm and is filed under Salads with tags arabic, eastern, fattoush, middle, salad. You can follow any responses to this entry through the RSS 2.0 feed. You can leave a response, or trackback from your own site. Fettush was one of my favourite in Lubenon , everybody should taste..